Gator fans rejoice with these cool pants in team orange, blue and white colors. Wear them for golf or just for fun. Click here to buy Orange & blue argyle gator color pants in stock now at CEOgolfshop. CEOgolfshop specializes in volume orders for active lifestyle apparel and executive gifts. While most companies carry only a few colors, we offer the entire line of each brand, so when a customer falls in love with a brand, they have the most choices. Many people ask if we have our own inventory, and yes, we do. We also ship direct from the factory for custom items to ensure product quality and provide full manufacturer warranty. We specialize in current season merchandise for the fashion forward customer. 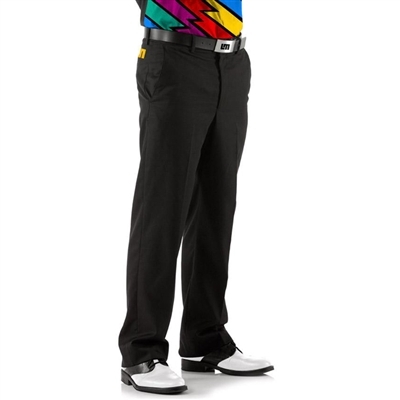 The Element Black pants are unusual for Loudmouth because they are solid black. Whether you love the brand and want something subdued, or want to buy the new funky shirts and need a solid color, they are a classic pair of trousers.Signature LM logo initials above the back pocket. Bushwood pants are popular year round. 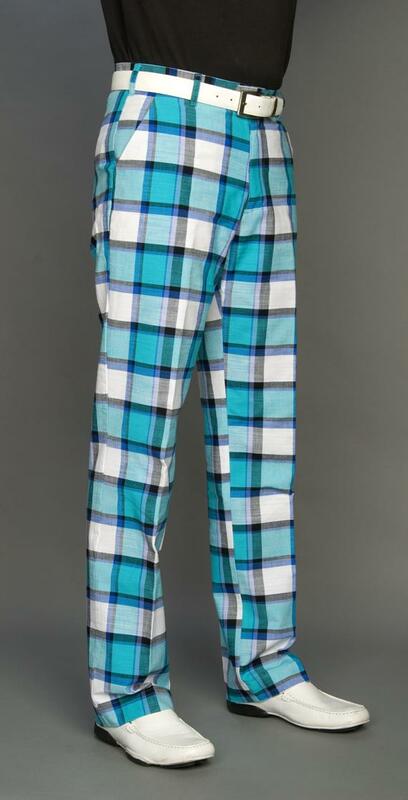 Whether you’re playing in a Caddyshack golf tournament, or seeking a more tame Loudmouth Golf men’s pant styles, these bold blue plaid pants are always a top seller at CEOgolfshop.com. Bushwood pattern is inspired by Rodney Dangerfield in the Caddyshack movie. We have plenty in stock, ready to ship out same day and next day. All sizes so you can outfit your whole team. FABRIC: 98% cotton, 2% lycra. This is a bit more cotton than other Loudmouth styles and we recommend ordering one size larger for a more comfortable fit. Sizes in stock: 30 inch to 38 inch waist. Click here to buy bushwood pants online now. CEOgolfshop is an authorized distributor for all Loudmouth Golf apparel. If you don’t see it, just ask. We carry our own stock for immediate shipment.